PIP provides you with a small window on the TV screen where you can view a second picture. Not all TVs are PIP capable but many of the older analog TVs had PIP capability and many of the newer digital TVs have Picture-in-Picture capability and also have Picture-and-Picture capability. This divides the TV screen into two same-sized windows side by side. Single-tuner PIP is the most basic, and dual-tuner PIP is the better of the two. With single-tuner PIP, you need the tuner from a VCR or a cable TV box in order to be able to watch a program on one channel and get another in the small PIP window. Dual-tuner PIP allows the TV to do this without the need of the external tuner. Hook-up guide for connecting your Analog Cable and VCR or DVD recorder to a TV that has single tuner Picture-In-Picture. For digital cable or satellite you need a different hookup. 1. Plug the cable TV or antenna leads into a two way (1 x 2) RF signal splitter. 2. Connect one output cable from the splitter to the TV's RF / Antenna Input jack. 3. Connect the other output cable from the splitter to the VCR or DVD Recorder's RF / Antenna input jack. 4. Connect the VCR or DVD recorder's Audio/Video RCA line outputs to the TV's A/V RCA line inputs. 5. Tune the VCR or DVD recorder to a channel or insert a tape or DVD and Play. 6. Activate the TV's PIP function and switch the PIP source to Video 1, Video 2, or Line-in. 7. You will see that the main picture is from the TV's internal tuner and the small inset picture is from the VCR tuner or tape, or DVD recorder tuner or DVD. 8. Push the SWAP button. 9. You will notice that the pictures have exchanged places and the main picture is now from the VCR or DVD Recorder. This hookup is for a DVD recorder or VCR with a TV (Analog or Digital) with single tuner PIP. If you have both a DVD Recorder and a VCR connected to your TV, and your Television has both Video 1 and Video 2 inputs, connect the VCR to one set and the DVD recorder to the other set. You can then access PIP from either Video 1 or Video 2, in conjunction with your TV's tuner. The VCR or DVD recorder must be powered on in order to use the PIP function in a single Tuner PIP set. 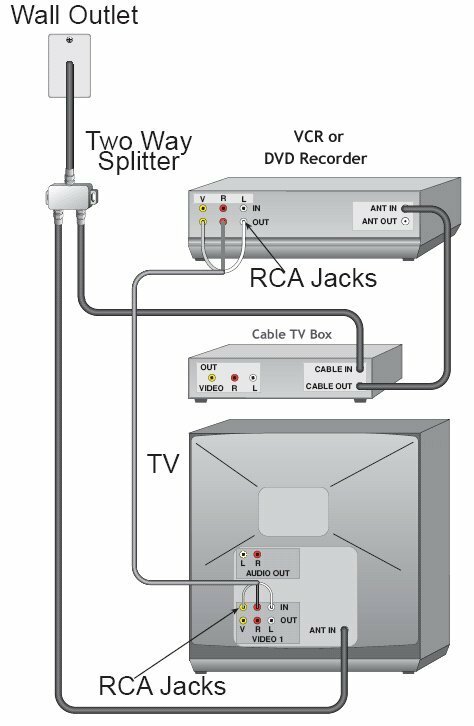 This setup must be done differently if you have a cable box, satellite box, or a dual-tuner PIP TV set. With digital cable TV or digital satellite TV signals, you must use a box to decode the signals because they are typically scrambled by your provider. This means you cannot use the tuner in your TV because your TV's tuner cannot decode the signals. Digital channels from your provider are secure and must use your provider's proprietary box to make them viewable on your TV. 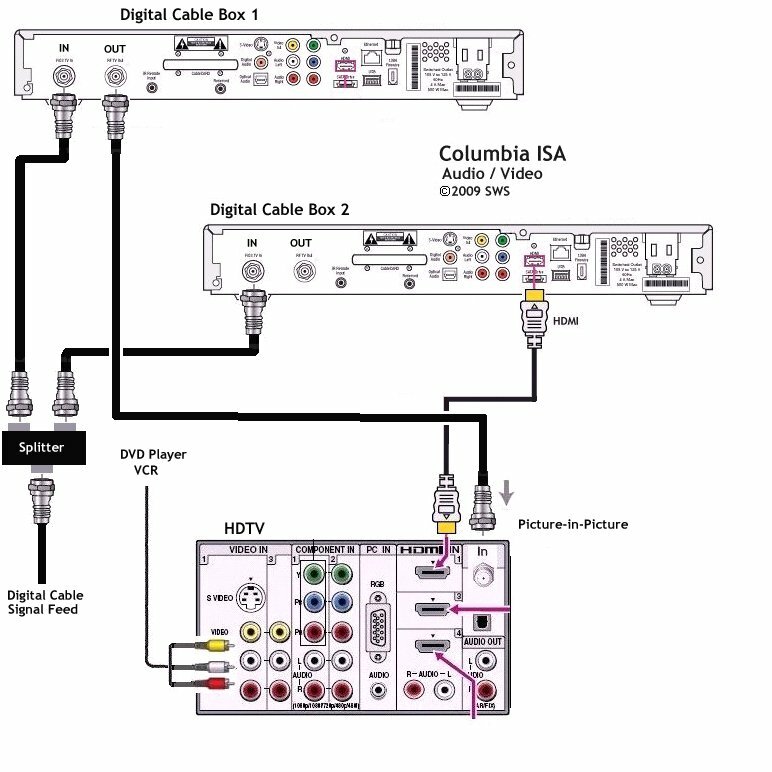 Therefore, if you want PIP with two digital channels on the screen, you have to have two decoder/receiver boxes and connect to your TV. Only one channel at a time can be tuned by the box. Until cable TV providers go all digital, you can avoid the two box requirement if your TV has a cable ready tuner built-in. This tuner can be used for analog non-scrambled channels which your cable TV provider may be sending out for the next few years. With today's HDTVs, this is the QAM tuner, not to be confused with the ATSC tuner for over-the-air digital TV broadcasts or the NTSC tuner for analog TV signals. Some HDTV sets are CableCard capable. CableCard allows the consumer to rent a small electronic card from their cable TV provider (if available) and install in the HDTV. The card is a substitute for a cable box in the sense that it does the same function of unscrambling the TV signals. The cards rent for less than a box per month saving the consumer some money. CableCard has been evolving for the past several years and has seen many problems. Digital cable boxes are two-way, getting signals from the cable company and sending signals back to the cable company. Pay-per-view is one example of two-way communications consumers may require for maximum viewing enjoyment and Cablecard has just recently upgraded to this capability. However there may be compatibility issues the consumer should check into before going this route. HDTVs today allow you to use the Audio/Video inputs on the TV as potential PIP and P&P connections. Switching on/off and swapping functions vary with each manufacturer. Typically there is a SWAP function on the remote control. Sony uses the OPTIONS button on the remote to control PIP functions. Once connected you can choose the video inputs to switch for each screen. Note: On many TVs, not all inputs are supported and there may be requirements for PIP to work such as the cable/antenna input must be connected.